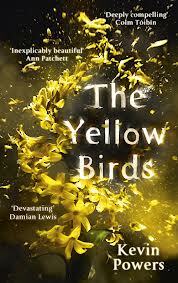 Kevin Powers’ debut novel, The Yellow Birds, was another that passed me by last year despite the fact it was extensively praised on publication. There was the worry that its timeliness was as important as its quality in the reception it received: here was a novel at last about the Iraq war written by someone who was there. In fact, there was no need for concern: this is a finely crafted novel both well written and carefully structured. This retrospective view, with Bartle looking back on his experience, also enhances the narrative, as does the novel’s structure. Though it begins in Iraq in September 2004, the second chapter takes us back to the previous December when Bartle and Murphy met for the first time. The Iraq chapters then alternate with those set after Bartle’s tour of Iraq is finished. This works narratively as we learn that something has happened in Iraq which Bartle regrets – he confesses to a priest, for example, “I just made a mistake is all.” It also makes clear that Powers is not interested in simply describing the war to us, but also in demonstrating how it affects the soldiers. It would obviously spoil things to reveal what that mistake is, but when all is revealed there is no sense of disappointment or artifice. Most surprisingly, I found the novel as interesting out of Iraq as I did when set there. For anyone interested in the modern experience of war – and shouldn’t that be everyone as we are all connected to these conflicts somehow? – this is an important book. You are currently browsing the archives for the Kevin Powers category.